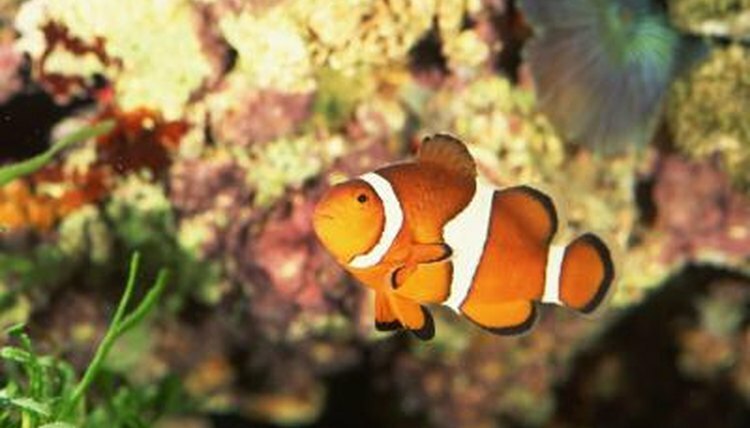 Unlike many saltwater fish, percula clownfish breed easily in captivity. Like many fish, their babies -- or fry -- require special care above and beyond that of their parents. Clownfish fry require special aquarium setups, feeding and water chemistry to reach adulthood. Once the eggs are laid, move them to the breeding tank. The breeding tank needs to be at least 30 gallons, though a tank as much as 150 gallons may be required. A density of seven to nine fish per gallon reduces aggression. When you place the eggs in the breeding tank, you will need to position an airstone near them -- but not bubbling on them -- to keep water moving over the eggs. Water changes will keep the water healthy. Change 20 to 30 percent of the water daily to ensure that it's clean and healthy. Clownfish fry require the same water parameters as adults. Above all, the water parameters need to be stable. In fact, you should fill your breeding tank with water from the main tank, at least initially. The temperature needs to stay between 74 and 78 degrees Fahrenheit. Your ammona and nitrite levels need to stay at 0.0ppm, and nitrate should stay below 40.0ppm, though lower is always better. Keep the salinity between 1.022 and 1.025 and the pH between 8.2 and 8.4. Feeding clownfish fry presents challenges. Unlike their adult counterparts, they need live food to survive. Rotifers make a great food for clownfish. These are tiny organisms you can purchase online or culture yourself. You want to feed so that there are 5 to 15 rotifers per milliliter of aquarium water. You can will also want to hatch baby brine shrimp yourself. Many pet shops sell brine shrimp hatching kits. These will feed the fry as they grow larger. After hatching, you will start feeding rotifers immediately. Continue to feed rotifers to the fry until they're about 10 to 12 days old. Meanwhile, you should start feeding baby brine shrimp at 6 to 8 days of age. The overlap between these foods accounts for the different growth rates of fry. Ideally, you should also add copepods to their diet, but these tiny crustceans can be hard to come by. Some sources sell them online. By the 15th day post-hatching, you can start to feed ground-up dry food. Make sure you use high-quality flake food intended for marine fish. The fry will reach sexual maturity between 9 and 15 months of age.